Yes, that’s three different funs. I’m serious . . .
Out of the blue (pun intended), my photographer, Ivan Phillips, sent me a bonus photo from the model shoot. (exhibit right) The model shoot for The Light Who Shines occurred almost a year ago and as much as I love the book cover, looking at the same photo for a year can drag on you. So this is a lovely surprise. 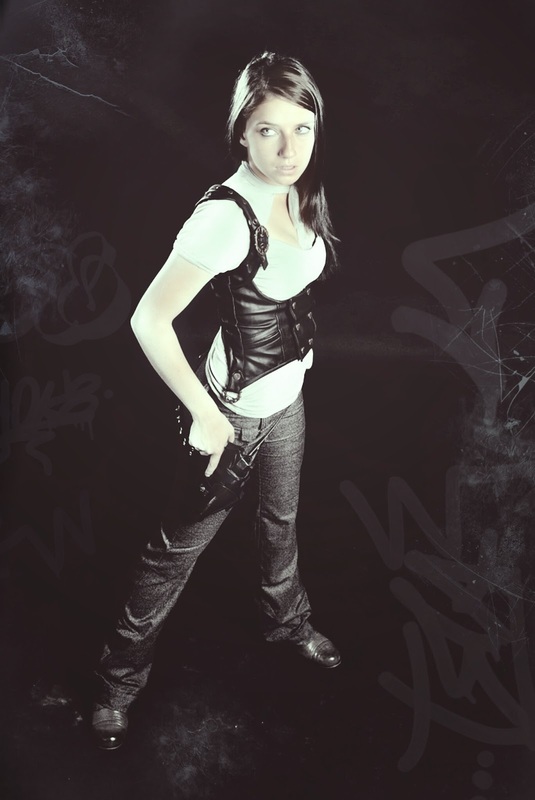 The model, Darlene Nuccio plays the part of Bluebell Kildare (a.k.a. Blue) on the book cover. Isn’t she beautiful? I say that with unearned pride, as though I were in some way responsible for how delightful she is. I am not. Nonetheless, it is a fun photo. I have no idea what effect he used to make it look like an old time tinted photo. I love it. Thank you Ivan! 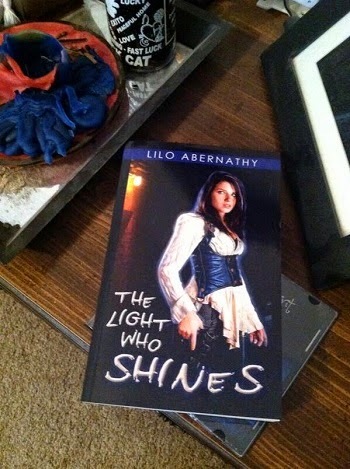 One of my readers sent me a photo of their copy of The Light Who Shines when it arrived in the mail. She was so excited to get it, but I’m afraid she wasn’t nearly as excited as I was to see a photo of my book in someone else’s possession. Trust me; I was flipping somersaults in my mind. I would have flipped them in person, but I’m 43 years old and I’m not stupid. I posted her picture on my website and my Facebook page and thus the Shining Lights Wall of Fame was born. 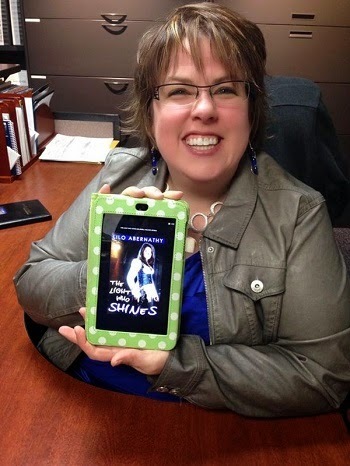 Readers have been sending me photos of themselves with their copy of The Light Who Shines and I’m tweeting them and plastering them wherever I can. Don’t believe me? I can prove it. I have to say that as a writer, nothing is more satisfying than seeing these photos of people who so obviously are enjoying my work. This book of mine seems to inspire questions. Well, first it inspires yelling and screaming fits, usually accompanied by the words “When will book 2 be done?!! !” so I try not to take it too hard. Yes, I am serious. I get yelled at a lot. So, I had this brilliant and unique idea to start a book discussion group on Facebook for people who had just finished The Light Who Shines. Okay, I’m lying. I actually read about another author doing this and stole the idea. However, it was a perfect decision to implement because of the sheer numbers of questions that immediately follow the screaming! What the heck is going on with the Belladonna Necklace? Will Jack and Blue bump the fur, bury the bone, do the nasty? It is an open group and anyone is welcome to join. However, there are spoilers, so I hope you finish the book first. There actually is a fourth bit of fun, but I’m not going to share that today. You’re going to have to follow my blog to be sure you catch it later.